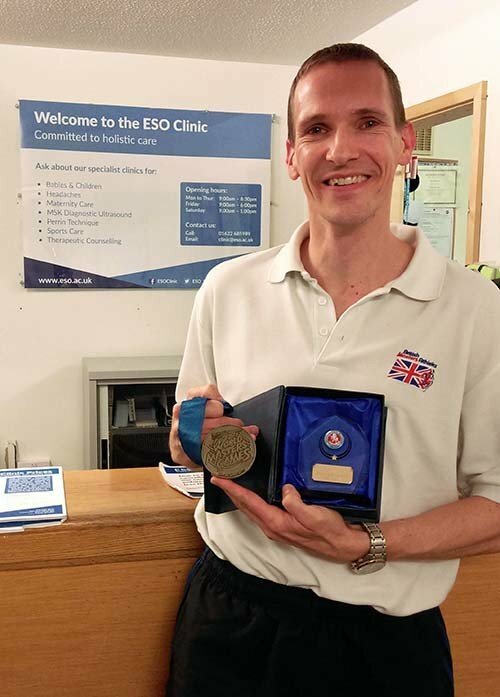 ESO Clinic patient Peter Davey has been winning track and field titles since becoming a Masters level athlete at the age of 35. In December 2017 he was named Kent Senior Male Athlete of the Year in recognition of his fantastic achievements. We caught up with Peter after his recent ESO Clinic appointment. “It was such an honour to receive the Award and totally unexpected – to be recognised at the age of 43 alongside previous award recipients like Adam Gemili was amazing and I still can’t quite believe it’s happened. At the start of 2017 it really didn’t look like it was going to be my year. I was totally focused on preparing for the World Masters Games, due to take place in Auckland, New Zealand in April; it’s the absolute highlight of my programme and with 28 sports represented it’s a fantastic event on par with the Olympics. Things were going well and I was in great shape until February when a hamstring tear threatened to put an end to my hopes. I was told by one of the ESO Clinic tutors that it could take up to 4 months for the injury to heal, too late for the games, which were only 10 weeks away. I’d been having treatments with my student practitioner, Monica, for a while so she knew how much competing meant to me – we were both determined to do what we could to get to me fit in time. I visited the Clinic regularly for treatment and was given a range of exercises to take away, which I followed to the absolute letter! We asked Peter why he chose the ESO Clinic for treatment. “I first visited the Clinic in about 2011 and over the years the treatments have, I feel, really helped my body recover from injury. I remember one time visiting with what I thought was an achilles problem – after a few sessions the treatment and exercises didn’t seem to be having an effect so I was referred to the ESO’s ultrasound clinic for further investigation. As it turned out there was nothing wrong with the tendon itself – it was purely the exit point for my pain. By focusing treatment on my back and hips the problem was resolved.